- Having a good spot to park the van was the best. With the back open - we could smell & watch the storm roll in across the ocean. We thought we had it all sorted. Van life with a toddler in a storm was super easy. - Zion didn't last long in the van. We watched the storm, felt all the feels a fresh storm brings and then of course Zion didn't want to be cooped up in our little home. - Australia has the best facilities - everywhere. Even in the middle of nowhere, there was a gazebo Zion could run around under and a BBQ to cook our dinner. - We definitely need to get the van more suited for rainy weather. Stay posted. Being there in the storm was tricky, not as easy as it would have been if it were just Josh and I. But seeing Zion snuggle into Josh when the sounds of the storm vibrated the earth, climb on his shoulders to see what was happening and back onto me for cuddles and breastmilk, continued to assure me that our family of three was exactly how it's meant to be. The storm only lasted one day, it cleaned the air, washed away all the mess and left Zion some fun mud puddles to get nice and dirty in. We are all so happy when we're outdoors, in amongst nature in its true form. Falling into a routine that feels so natural, even with Zion. I think he was truly born to be outside, this nature baby of ours. Exploring and climbing whenever he can. 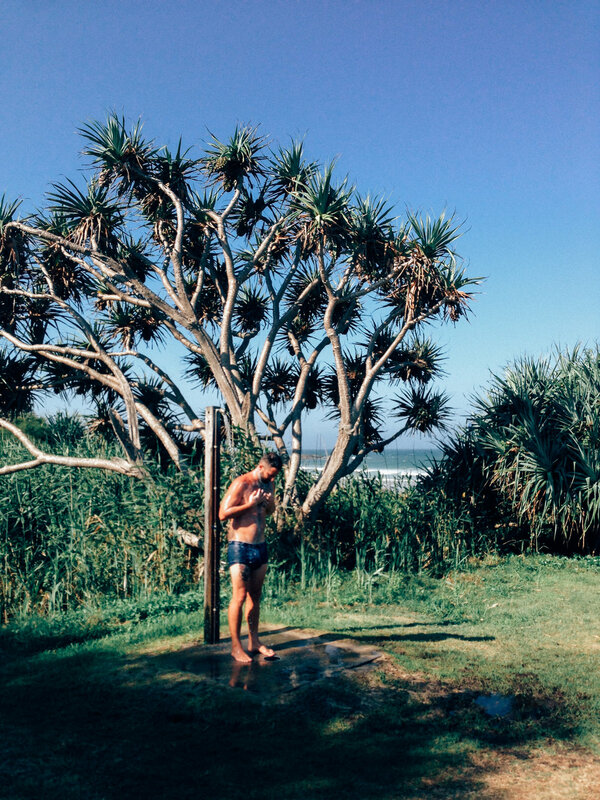 And for us - waking up to the sound of waves on the shore, exploring the beauty of the hidden towns we'd never noticed before and finding a beach shower to feel clean again - were part of the every day that made Yuraygir so special.